25 April 2018: – Yesterday, the boring classroom lesson was finally consigned to the history books when technology pioneers, Immersive VR Education, beam experts from California and Dubai into a virtual classroom to teach students at Langley College near Slough, via a short trip to the moon. The Pixar animation guru and Oscar winner will be joined by the Dubai-based teacher and VR pioneer, Steve Bambury. Steve, from the Jumeirah English Speaking School (JESS Dubai), will take students on a VR journey from Slough to the moon and then to an ancient stone circle in Wiltshire so they can experience the transformative power of VR on a lesson. The technology behind the lesson is ENGAGE from VR boundary breakers, Immersive VR Education. It is a free to use virtual reality teaching platform for schools, universities and businesses that allows them to create a virtual classroom to bring together teachers and learners from anywhere in the world. 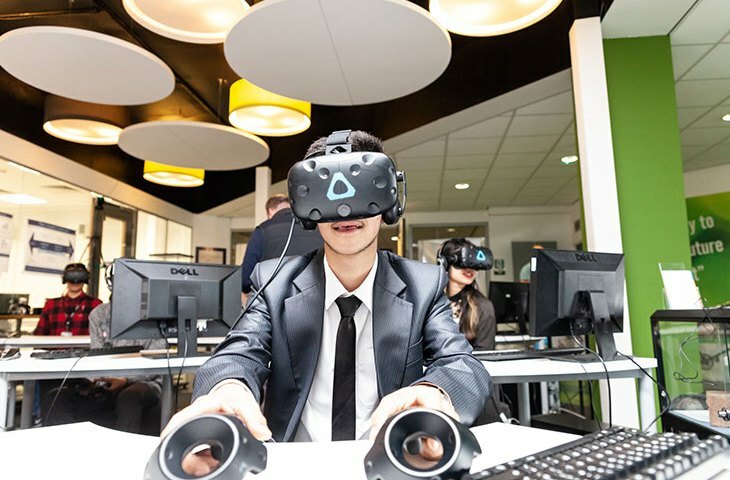 The ENGAGE platform will be running on HTC Vive’s VR technology and the recently launched HTC Vive Pro, allowing up to 10 students to simultaneously take part in the lesson. Virtual avatars will represent participants, enabling them to see and interact with one another and the teachers. As well as discussing his past work with Lucasfilm and Pixar, students at the event will also hear about some of Loren’s boundary-pushing work in the field of mind-matter interactions from the Institute of Noetic Sciences in California, where he is currently a visiting scholar. The ENGAGE platform is a free to use social education and presentation platform. ENGAGE allows users to hold meetings, classes, private lessons and presentations with people from all around the world in a safe virtual multi-user environment. The University of Oxford in the UK has already created content within ENGAGE to train doctors in Africa in infant life-saving techniques in an attempt to reduce infant mortality rates. Immersive VR Education is an award-winning virtual/augmented reality software firm dedicated to advancing how educational and enterprise content is shared and consumed globally. Founded in Ireland in 2014 by husband and wife team David and Sandra Whelan, Immersive VR Education has global recognition for its award-winning Apollo 11 experience (https://youtu.be/kVP2aN2JMgk) and ENGAGE platform (https://youtu.be/QVu_YTnr-l0). The company was recently listed on both the Irish and London Stock Exchanges.